Above: Alamo Square, 1906. For 3 days, citizens, many with only the clothes on their backs, gathered to watch the city’s destruction. Photo: San Francisco History Center, San Francisco Public Library. Its checkered history is far from square. Alamo means poplar tree in Spanish and in the early 1800s, the lone cottonwood on Alamo Hill marked a watering hole along the horseback trail from Mission Dolores to the Presidio. 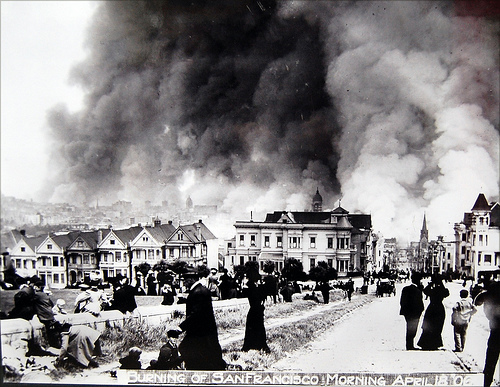 Mayor James Van Ness set aside 12.7 acres of the hole in 1856, naming it Alamo Square. Confirmed by the state legislature the following year as a public park, Alamo Square and its Victorian residences started down the potholed road to Historic District, over 100 years later. In the ‘50s the beautiful park slid into two decades of deterioration. Homeowners moved away and sold their Victorians to entrepreneurs who divided them into multiple-bedroom rooming houses, many illegal and substandard. Some became halfway houses, drug rehab centers, or boarding houses for hippies. Displaced residents seeking housing flooded in when the Redevelopment Agency demolished large sections of Western Addition. Safety in the park became a serious issue. The Alamo Square Neighborhood Association was founded in the early ‘60s when a group of concerned neighbors banded together to fight the City’s plan to slice off the crest of the hill, level it for playing fields and construct a large field house. The protest of outraged residents, the media, and Mayor Joseph Alioto defeated the passage of ill-conceived Measure D. In the early ‘70s, when ASNA’s president complained to the police about an epidemic of drugs, burglaries and muggings, the department stepped up patrols, day and night. Over the next decade, conditions improved, and in 1984, thanks to the energetic efforts of a few key ASNA homeowners, Alamo Square’s 12 blocks became a Historic District. The 1990s were marked by an unsuccessful grant application to the Recreation and Park Department for park beautification and failed requests for maintenance and repair, including the dilapidated playground. A Park Committee of ASNA worked closely with NPC to encourage workdays and to lobby for playground funds. After Props A & C passed in the 2000 election, Rec and Parks’ Capital Improvement Plan allocated $1,270,000 to Alamo Square. Sue Valentine, then ASNA president, and parks committee chairman Emmett Gilman listed 14 key issues, secured agreement on them with project director Marvin Yee, and followed up, point by dogged point. The results are in full view throughout the park: the new children’s playground, picnic tables, benches and lighting; ADA pathway at Hayes and Steiner, and dispensers for dog waste bags. The new wrought iron fence around the playground required a $36,000 subsidy from ASNA to upgrade the chain link version. Volunteers needed! Planting, gardening, weeding, and general park maintenance. Contact park@alamosq.org to sign up!